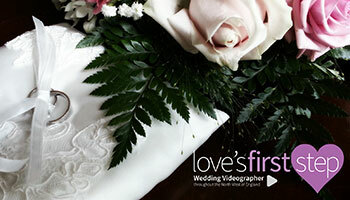 To help you choose the right wedding film for you, here you will find a few of Love's First Step's most popular packages and extra's that can be requested to really personalise your wedding DVD. My bespoke service aims to create your perfect wedding film and why I am completely open to any ideas or suggestions you may have to get the best from your wedding day's footage. 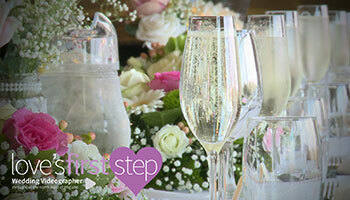 With prices starting from £950, if you would like any additional information on any of the packages shown or would like to enquire about my availability for your wedding date, bespoke packages or would simply like arrange your free no obligation consultation, please don't hesitate to get in touch at info@lovesfirststep.co.uk or feel free to call Scott on 07890 033743. 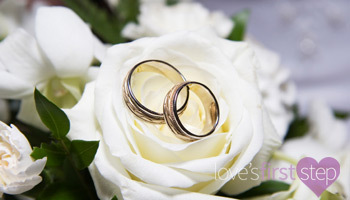 For couples wanting just the key moments of their day captured on film, my 'Hugs'n Kisses' package starts with the arrival of the Bride and Groom to the church or wedding venue with coverage of the wedding ceremony, wedding reception, speeches and cake cutting through to the first dance. This beautiful film is an ideal choice for couples looking for a film that fits in with their budget. With your wedding day footage then professionally edited to music, your finished film is then presented in a deluxe presentation pack. 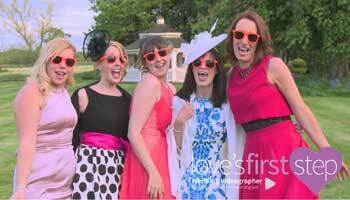 Love'n Laughter is simply what this package is all about, a popular package for many couples where all the footage filmed on the day is professionally edited to create a wonderful highlights film telling the story of your wedding day. Starting with all the fun, laughter and excitement of your mornings bridal preparations, along with the arrival of both the Bride & Groom, you can expect tears and laughter as your film features the best of your wedding ceremony, photographs and confetti, arrival at the wedding with coverage of your wedding breakfast, cake cutting through to your first dance and evening party. Professionally edited to a single track of your choice and presented in a deluxe presentation pack, this wonderful package is the ideal choice for couples wanting to invest in a quality keepsake that captures the whole of their wedding day. For couples wanting the best of the entire days coverage and more, this wonderful feature film package is my top package and includes all the features of the 'Love' n Laughter' package with additional coverage and sound bites from the best of your day, including your wedding vows and the best of your speeches. Professionally edited to 3-4 songs of your choice and with an approximate running time up to twenty minutes, the Happily Ever After Package is the ultimate package to showcase the very best of your wedding day in a truly wonderful keepsake. Your wedding film will then be presented to you with your personalised wedding DVD with interactive menu and deluxe bespoke presentation pack. With family, friends and guests a big part of your wedding day celebrations, why not let your guests offer you their own personal video messages in this optional extra which has become a popular feature with Loves First Step Wedding couples. This great addition to your wedding DVD, can be a real tear jerker with the funniest of outtakes and heartfelt wishes from those happy to share their thoughts on your special day. With guests invited to share a few words before the evening celebrations get underway, this popular extra is sure to be a welcome surprise and will be incorporated as an additional film on your interactive wedding DVD. Having filmed weddings all over the UK including Southern England, Wales & Scotland, an additional charge may be incurred for weddings further away to enable accommodation for the night before & possibly the night of the wedding. This ensures I am with you from the start of your day through to the evening, so as not to miss any of the day's excitement. I am happy to discuss this further upon request.